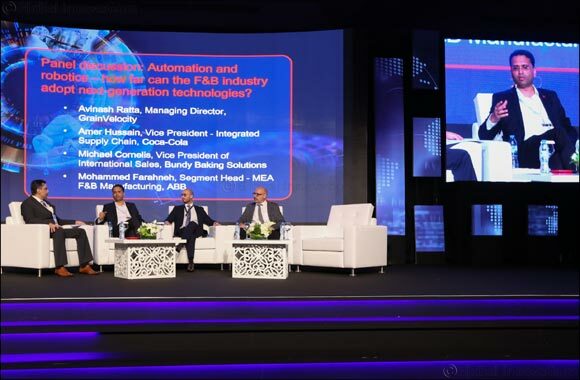 Dubai, UAE – Thursday 8th November, 2018: Digitisation, Artificial Intelligence and next-generation technologies came to the fore on day two of the Gulfood Manufacturing FoodTech Summit, as key industry experts take stage discussing the future and transformation of F&B manufacturing facilities in the region. The agenda-setting Gulfood Manufacturing FoodTech Summit, running alongside Gulfood Manufacturing at Dubai World Trade Centre (DWTC) this week, brought together international F&B experts, industry leaders and innovators to discuss the global F&B market development and latest solutions with the future in focus, including how to adapt to digital transformation. Industry pioneers have been taking to the stage during the high-powered, two-day Summit to share knowledge and insights into best practices and efficient use of 4th industrial revolution technology to overcome industry challenges. While Summit delegates heard throughout the sessions of the need to collect, analyse and utilise data across the entire manufacturing supply chain, global industry leader Coca-Cola revealed how it has invested in digitisation to its advantage. Amer Hussain, VP, Integrated Supply Chain, Hindustan Coca-Cola, revealed how his plan to automate a bottling plant, based in the Indian state of Gujarat, has had immediate, measurable results in greater efficiency and a reduction of costs – turning the plant into a benchmark for digitisation across the F&B manufacturing sector. Digitising the workplace means Hussain and his team have improved the life expectancy of the plant, increased equipment availability, and improved planning and cost optimization. “We have gained real-time machine insights and enjoy predictive maintenance and analytics. We have a far more accurate grip on inventory, and have seen an improvement in material yields, with a lean inventory,” added Hussain. Other benefits enjoyed by the sate-of-the-art factory include real-time energy management, inventory management, stronger and easier management of QSE systems and a holistic view of activity over the fully connected, paperless factory. In a thought-provoking session on day two, Mike Yesudas, CTO of Watson Customer Engagement Services and Distinguished Engineer at IBM, took to the Summit Stage in a session titled ‘Artificial Intelligence – is it worth your investment?’, which looked at how AI has been introduced across industries and how it can be successfully implemented in the F&B industry. Yesudas told Summit delegates how AI is fast approaching wide-scale roll-out in everyday business and how the F&B sector must be ready and willing to embrace the “new era”, including data analysis.